Learning PRINCE2 Poster 37 - What Does PRINCE2 not Provide? 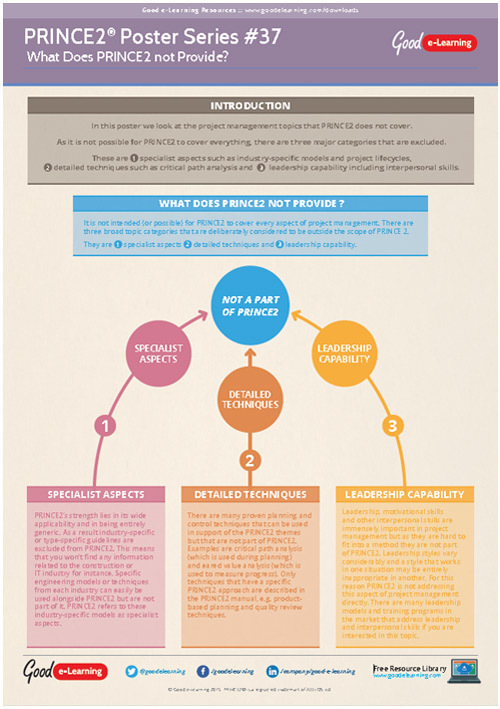 In this PRINCE2 poster we look at the project management topics that PRINCE2 does not cover. As it is not possible for PRINCE2 to cover everything, there are three major categories that are excluded. These are (1) specialist aspects such as industry-specific models and project lifecycles, (2) detailed techniques such as critical path analysis and (3) leadership capability including interpersonal skills. Download this PRINCE2 learning resource and you’ll also get instant access to 520+ business & IT learning resources!